Young kids, and really, anyone inexperienced in mixing colors, tend to be satisfied using the colors right out of the box or tube. Crayola provides 12 or 18 colors. That ought to be enough, right? These two pages provide space for your kiddos to mix way more colors than that without any more instruction than that. Play, mix, create. It’s a color mixing challenge. Besides the basic, bright colors encourage your kids to make the dull, in between colors. Knowing how to mix neutral colors is worthwhile skill. These two pages of color mixing challenges can be done in whatever paint you have available. We used simple Crayola watercolors but feel free to use what you have! Complementary colors are opposite each other on the color wheel. Learning to mix them opens up a whole new world of neutral colors and not so bright colors that are crucial to painting in a lifelike way. Real life doesn’t happen in only candy bright colors! 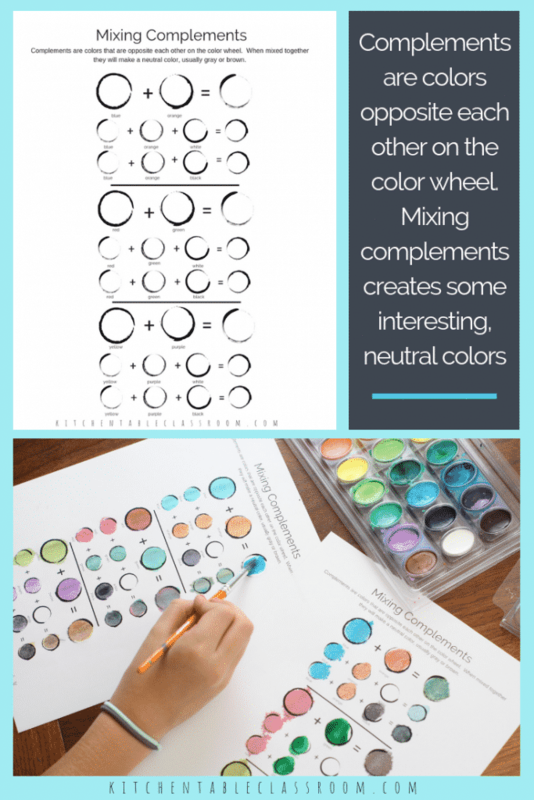 This color mixing chart allows for experimenting with mixing pairs of complementary colors as well as the addition of black and white. You certainly can use watercolor paints for this this, just as we did on the color mixing chart above. Adding black and white is a little different when using watercolor paints though, and you might want to give your kids a heads up. Traditionally watercolor paints don’t use white but instead the color gets lighter with the addition of more water. Using watercolor paints for this color mixing exercise requires a but more delicacy which may or may not be a strength of your kiddos. Using tempera paints (washable) or craft acrylics paints (not washable) are both great cost effective options for kids for all kinds of painting experiences! Mixing primary colors, secondary colors, and beyond….. This color mixing chart provides a little more structure than the “How many colors can you mix…” charts. This page will walk your student through making first the primary colors, then the secondary colors, the tertiary colors, as well as experiment with mixing pairs of complementary colors and values. Analogous colors are neighbors. They are groups of three colors that are next to each other on the color wheel. It’s a big word to describe a simple concept. Since analogous colors are similar they tend to create a harmonious feeling. Groups of harmonious colors blend into one another easily and just look pleasing together! 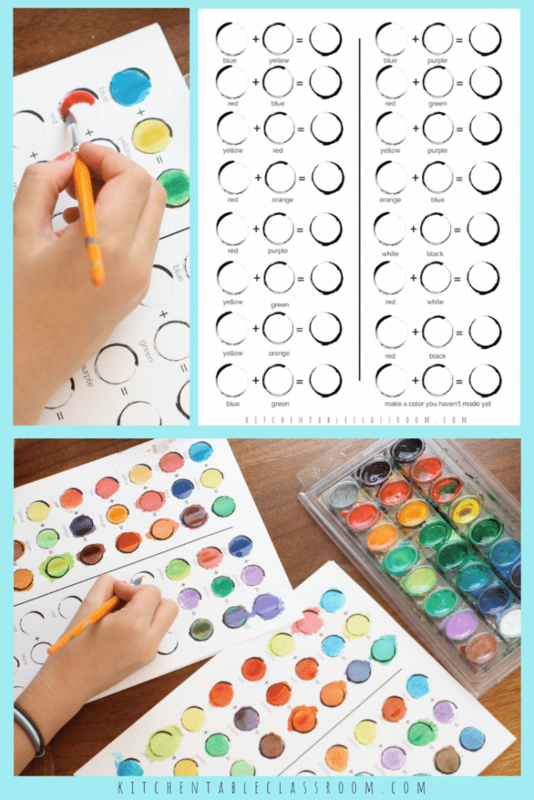 This color mixing chart give your kids the chance to identify the colors analogous to the three primary colors. Value is the lightness or darkness of a color. Tints are created by adding white to a color while shades are created by adding black to a color. 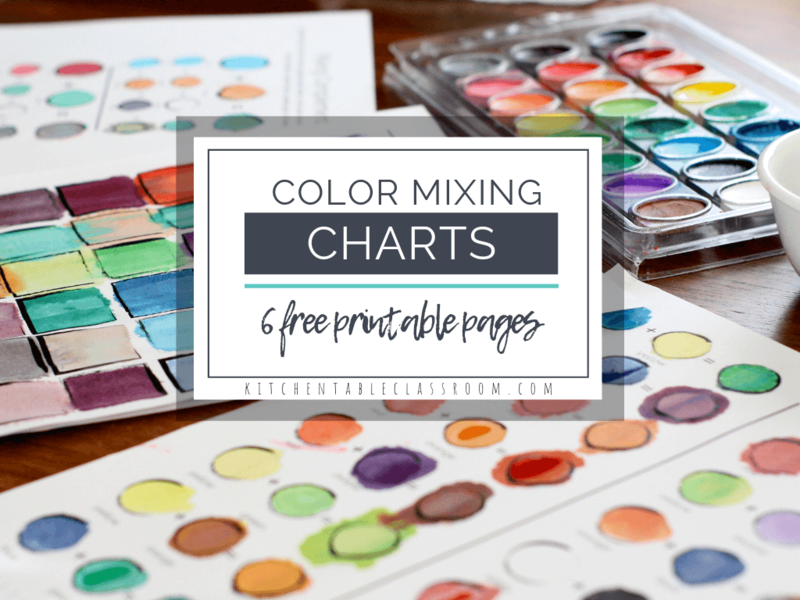 Want to grab you own color mixing chart…. Use the form below to become a Kitchen table Classroom subscriber. Upon confirming your subscription you’ll get a subscriber only password that will give you instant access to my Free Resource Library. 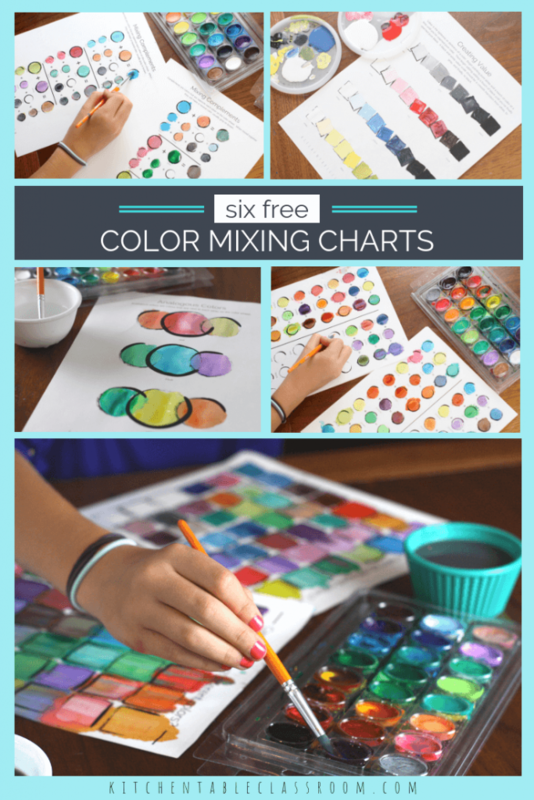 There you’ll find this set of color mixing charts in easy to print PDF form. (Just click on the thumbnail image and PDF that includes all six pages will pop right up! You’ll also get a weekly newsletter from me that will make sure you’re the first to know about all my newest projects and free printables! 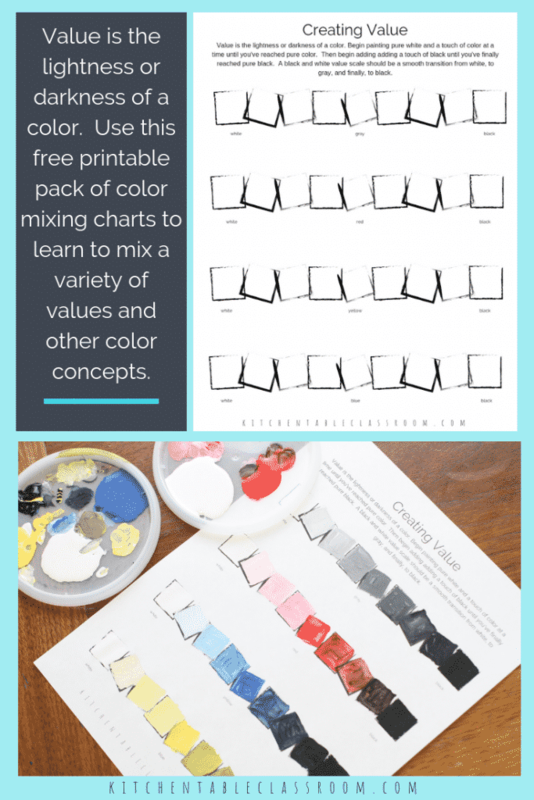 If you love this color mixing chart but are looking for this same concepts presented in a more elementary manner check out this free printable book all about colors concepts! 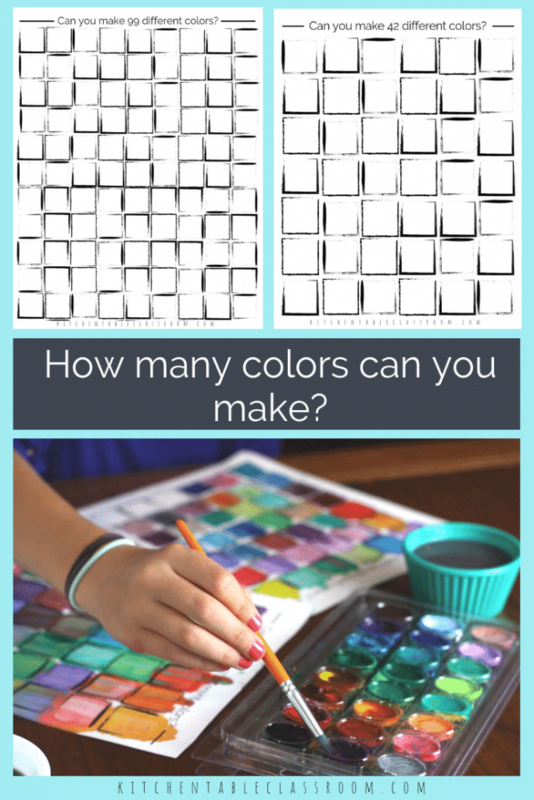 Did you enjoy this color mixing chart? If so I hope you’ll share it! It makes such a difference! Every single share helps me to grow the Kitchen Table Classroom and bring you more fun projects and free printables! I think when people see the rigid squares they might initially give it too much thought, instead of the feeling of just jump in. Thanks Linda! I’m definitely of the “jump right in” school of thought!